This series of posts based on SOLAS V continues to explore some of the details behind Regulation 23, Pilot Transfer arrangements. This time exploring the specifications within Resolution A.1045(27) covering combined accommodation ladder/Pilot ladder arrangements. Why would a combined arrangement be required? In accordance with SOLAS V an accommodation ladder shall be used in conjunction with the pilot ladder, or other equally safe and convenient means, whenever the distance from the surface of the water to the point of access to the ship is more than 9 m.
satisfaction of the flag state. Treads and steps of the accommodation ladder should be so designed that an adequate and safe foothold is given at the operative angles. The accommodation ladder should be at least 600 mm in width. The vertical space between the handrail or handrope and the stringers of the ladder should be securely fenced. 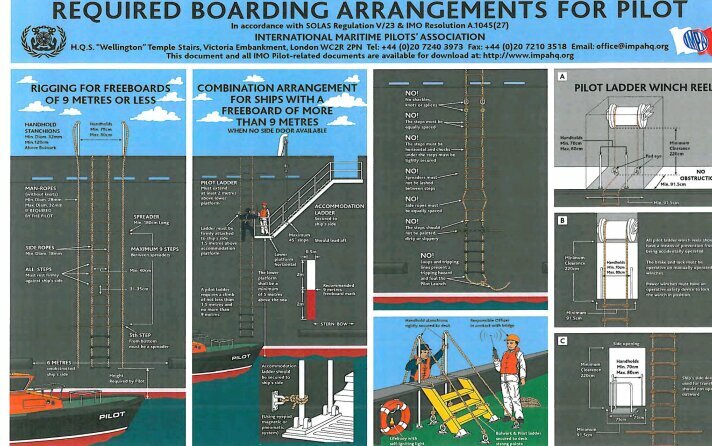 The last post covered the pilot boarding arrangements required by SOLAS V, this post delves a bit deeper into the detail with a summary of some of the specifications and dimensions of pilot ladders. Where can the requirements for pilot ladders be found? SOLAS also requires compliance with this International Standards Orginisation standard. What are the requirements of Pilot Ladder steps? What are the requirements for pilot ladder ropes and lines?